I’ll be honest with you, I let my kids eat candy. I have a candy bowl that sits on top of my fridge and they get to pick a piece about once a day. 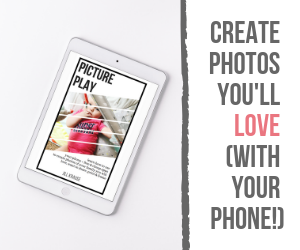 We use it for rewards for all sorts of things…eating all their dinner, helping with the chores, being nice to each other, and sometimes just because they are so darn cute. Yes, I admit it’s not the best way to reward our kids but it works for us. I do try to limit their junk food so I look for healthier candy and treats. There aren’t a lot of options for health food stores locally so I’m limited to the popular grocery and drug stores for our shopping. They don’t normally have a large organic or natural food selection – although the selection is growing. 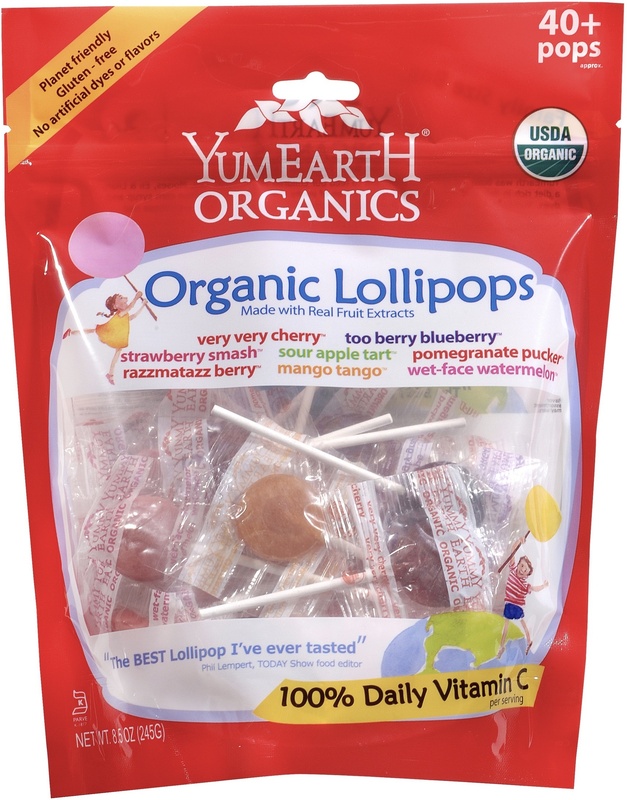 I was very happy to find out that a new organic candy company, YumEarth Organics, can now be found at Publix, Walgreens, and even Homegood’s stores. I actually saw them on the shelves at Marshall’s just last week and heard that they are launching in Target stores soon! We’ve been snacking on our gummy bears and lollipops for the past two weeks and my kids love them. 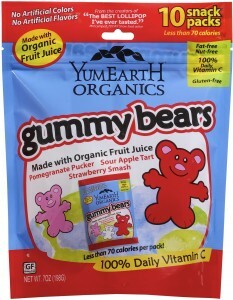 I’m a huge gummy bear fan and they certainly pass my taste test. They taste more like juice than traditional gummy bears and that works for me. The lollipops come in some fun flavors like Very Very Cherry, Too Berry Blueberry, Strawberry Smash, Sour Apple Tart, Pomegranate Pucker, Razzmatazz Berry, Mango Tango and Wet-Face Watermelon. My favorite is the Pomegranate Pucker, my sons is Too Berry Blueberry, and my little red loves the Strawberry Smash. I think I even caught my husband sucking on a lollipop last night after dinner. Would you like to try some YumEarth Lollipops? Enter the giveaway below using the Rafflecopter application. 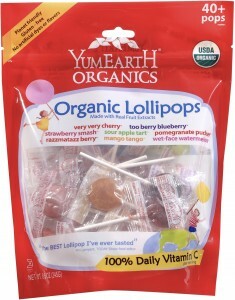 I’ll pick a winner next weekend for receive a full bag of lollipops from YumEarth. Good Luck! These are our favorite suckers! I don’t give DS much candy but when I do I try to give him these. I like that they are free of artificial flavors and colors and they are soooo tasty! I don’t like my kids eating a lot of candy at all but it does make it better if it is not high fructose! These are great! My DD is a little young for the hard candy but we have given her candy before for sure! Mostly because my dh loves candy and will give her some at times. She just loves it lol. My girls love to have candy as a treat but we do limit their sweets and their snacks usually consist of fruits and veggies. And we actually love YumEarth and are running low, so we’d love to win! My 2nd child has a very strong sweet tooth! We don’t let her have a lot of candy, but do keep a small stash on hand to give as rewards. Recently we have removed all artificial colors, preservatives, etc from our diet (including the candy stash) and I just ordered some of the YumEarth products to try out. Every time my nephew comes over to visit, he’s always looking for candy. I would have no problem giving him these!!! I have a 5lb bag of their lollypops and love the way they taste. I don’t give a lot of candy to my child. But sometimes I just feel so bad b/c she wants it so much! So I will let her, I HATE high fructose corn syrup. . . I would love this, and wouldn’t feel guilty for giving her it! my toddler son LOVES yumearth!!!!!! its the only candy i will allow him. i sneak a bear or lollipop sometimes b/c they are just so yummmmmy. We don’t do much and I’m really trying to stay away from High Fructose Corn syrup. These look like a good alternative! Dd isn’t too big on candy but she will ask for it every now & then. She does like lollipops so I would love these to give to her when she does ask. I can’t wait until they are released in Targets! I like me some candy….get in my belly mr. candy!! !